This book is a bit of an adventure. Mirroring what our world is slowly becoming there is a reliance on escaping the real world into this digital mecca. Emika is spirited with strong morals and by no means a perfect heroine, she isn’t even supposed to touch technology never mind use it. Admittedly I found the plot point that she gets called up by Hideo Tanaka (her hero) to partake in the very tournament that she managed to glitch into, on the unbelievable scale, but hey that is fiction. Enter a plot filled with technology, and a spy filled mystery with a smidge of romance (duh). 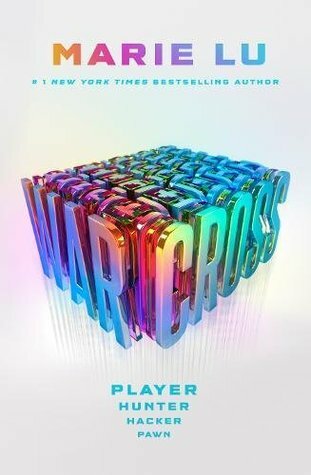 Marie Lu builds a gamers world with a thrill and fantasy that encompasses the genre. She manages to convey the adrenaline which accompanies a high octane sequence in game but on the page. As the book continues we learn more about Emika and Hideo as they struggle to catch the person causing the security problem. They aren’t one dimensional characters and are not at all perfect. Emika and Hideo’s blossoming romance makes sense from Emika’s side more so than his. She has worshipped this guy for years, she has literally met her idol and he appears to like her. Emika’s relationships with her team-mates was heartening. She got on well with them and it felt like she had finally found a place she belonged, she was with her kind as such. Speaking of her team-mates and the wider Warcross players are truly diverse. As a worldwide phenomenon there seems to be no area that was left untouched by them. They are from all nationalities and many have disabilities in one form or another but are all united by playing a game. The game provides the opportunity for them to escape their real-life and stand amongst equals. As the plot progressed, personally I was able to guess what was happening however the story is so well written that I didn’t mind that I was able to guess some plot points as others were weaved in. Overall this is a great read, a one-nighter for myself. I enjoyed that it explored how we use technology today and how we could use technology in the future – for better or worse.